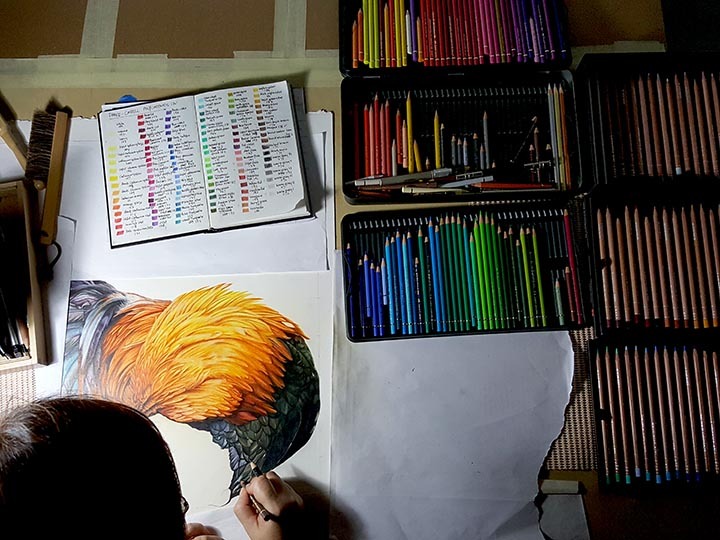 It got me wondering, what if I paint this rooster without its head, quite unconventional to see paintings of chicken without their head. Can people accept it. So I told myself, why not try painting one and see how it goes. So off I went one lovely bright Sunday afternoon to that hilltop, took my camera and drove all the way up and hoping those chicken will still be around. As I parked my car, lo and behold, I saw this puffed up rooster strutting around the compound with an entourage of female companions. The weather was hot and bright and his feathers practically glowed under it. Like the females, I followed him around and tried to capture the perfect shots. Like a proud fellow he was, he did several poses right in front of me, such a vain pot! Back home, while looking through all the photos that I took, I realised this rooster was always preening himself and I have only took a couple of head shots and he does not look too hot in that pose. But those pictures of him preening was perfect, his feathers were gloriously shinny and those colours were just WOW! 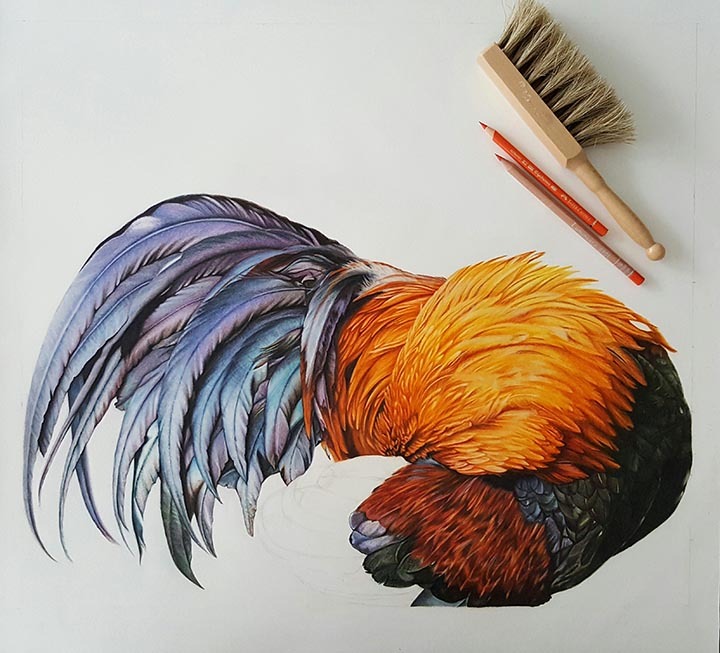 It got me wondering, what if I paint this rooster without its head, quite unconventional to see paintings of chicken without their head. Can people accept it. Obviously they will know it is a rooster but will it look weird? 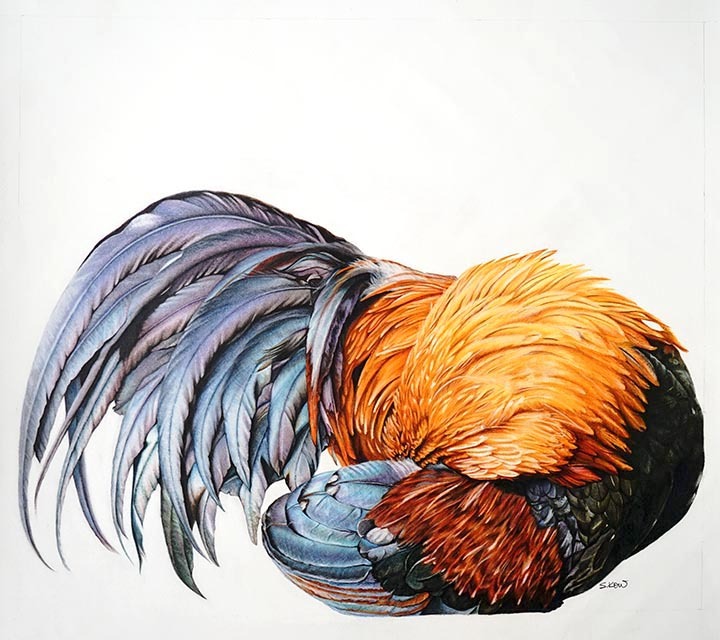 I surfed the internet looking at paintings of roosters or chickens and most of them were very conventional, means with the head, whether it is side or back poses, it is always with its head. But to me, I put it in an artist point of view, I think, it can a very good conversation piece. Some people may accept it, some may not and why I do fret so much about what people think it should be? But still, I was quite unsure. Just to ease my mind, I asked the opinion of a friend who is a chicken enthusiastic. The minute I shared the photos with her, she picked the same reference that I picked. And according to her, that is a normal pose for a rooster, anyone who knows chicken will know that it is a chicken, no doubt about it. PHEW, what a relief and that gave me confident and I went ahead and did it. 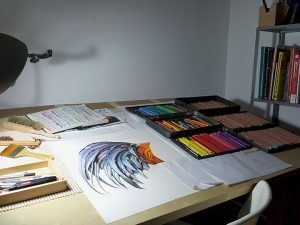 The size of this piece is 22 x 19 inches (55 x 48 cm), done on 300gsm hot pressed Arches Aquarelle water colour paper, using Faber-Castell Polychromos and Caran D’ache Luminance colour pencils. I kept the composition of this piece clean by leaving a lot of negative spaces (the whites) and brought the subject lower towards the bottom of the paper. 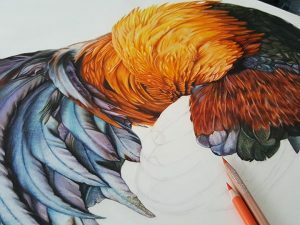 By doing so, the focus of the viewers will be on the feathers of the tail and that will lead the eyes to the body and subsequently to the neck of the rooster. 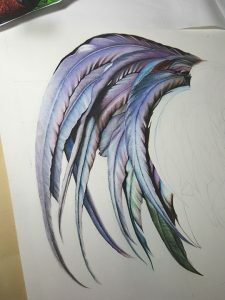 By doing so, they will know that the head is hidden inside of the wing. 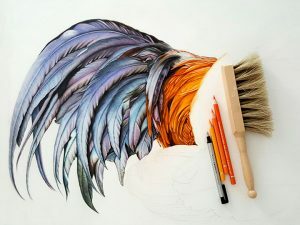 The focus here is on the multitude of strong intense colours and details of every feather rather than just a rooster. 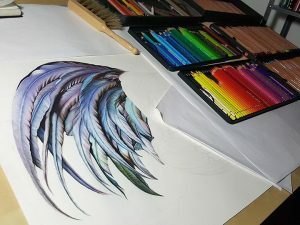 In this piece, the versatility of colour pencil really showed through and that was my intention. This is such a wonderful, unique drawing Sharon. The intensity and richness of colour you achieve is mind boggling! Thank you so much Anna for your comment. I truly appreciate it, very much.